As always, it was great hearing from everyone. I married Matthew Bernstein on Aug. 25, 2013, at the Westin in Waltham. Many Brandeis alumni were in attendance, including Steve Whitfield, PhD’72, the Max Richter Professor of American Civilization. We enjoyed celebrating back in our hometown with so many friends. Philip Weintraub and his wife, Rebecca, had a baby girl in October 2012. They look forward to celebrating with their Brandeis friends. Yuval Simchi-Levi married Wendy Link on Aug. 11, 2013, at the Four Seasons Hotel in Boston. He is an assistant district attorney in Manhattan. Wendy is a senior technical designer at Rebecca Minkoff, a designer of handbags, accessories, footwear and apparel in Manhattan. Anna (Rakhman) Hershberger and her husband, Matthew, welcomed their first child, Eli Michael, on July 27, 2013. Eli joins an already full house that includes two cats and a Labradoodle. 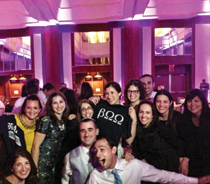 Edward Greenberg finished the second year of his internal medicine residency at Case Western. For the next three years, he will be conducting cancer research. Stephanie (Steingold) Bressler and Jason Bressler had a beautiful baby boy, Holden Charles, on May 6, 2013. Mom and dad are loving parenthood so far. Aviva Marlin and her husband, Evan, welcomed a son, Gabriel Tobias, on April 11, 2013. Sophie Innerfield ’05 married Nick Balkin on June 22, 2013, in Somerville, Mass. They met at Berklee College of Music, where they both work. Sophie is a project manager, and Nick is a publicist. WARM EMBRACE: The wedding of Judith Lupatkin ’05 and Matthew Bernstein attracted a large contingent of Brandeisians. Front row, from left: Tamar Senderowicz ’04, Matthew, and Josh Blechner ’04, MA’04. Back row: Sarah Trachtman Blechner ’05, Shanna Nussbaum Goldstein ’05, Samantha Pohl ’05, Judith, Mira Abramsohn ’05, Glenn Prives ’06, Jessica Abramowitz Rachovsky ’05, Genna Singer ’02 and Debra Weiss Alper ’04.